chibi: [chee-bee] adj - a certain style of drawing characters in a cute and deformed way with big heads and small bodies. There's a bunch of definitions for chibi, but that was the closest definition I could find for the theme of the contest. And the theme is this: build the smallest possible Star Wars vehicle that can still seat a standard minifig. The idea is to go for a super-deformed look of a ship or vehicle that's still functional. It's quite detailed for its size and can still seat the Dark Lord himself, it's just smaller. Build a Star Wars-themed sea, land, air, or space vehicle as small as possible that can still seat a standard minifig. Your vehicle must be canon, i.e. appearing in any of the 6 films. Vehicles from The Clone Wars cartoon are also acceptable. You may also build a vehicle from EU that has already been produced by LEGO. Your vehicle must include and seat at least 1 Pilot/Driver. If the vehicle requires an astromech droid, such as an X-wing or Y-wing, your chibi fighter must also be able to include a standard R2 droid minifig as well as the pilot/driver. New models only. No recycling past projects. Real life models using official LEGO elements only, no renderings or clone brands allowed. Submit up to two photos as a reply to this thread for your contest entry. You may provide a link to a flickr gallery or your photostream for more pictures. One photo must show the vehicle with the pilot/driver seated (and astromech if necessary) at the controls. You must also submit at least one picture to the FBTB:flickr Outpost pool and tag it with "Chibi Fighter". Submission deadline is 11:59 PST January 31, 2011. Voting will commence on February 1 for a period of one week. Top 5 most popular submissions go through to final round of voting to last three days. Grand Prize: You know you wouldn't spend good money on it, but if you could get it for free would you turn it down? 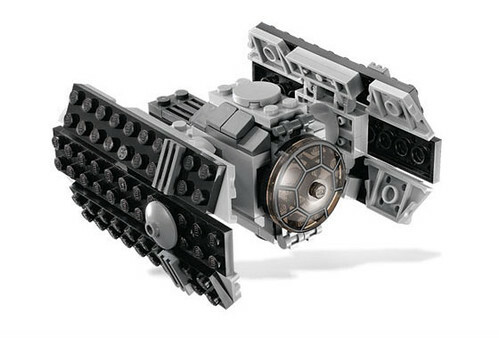 That's how I feel about the UCS Jedi Starfighter. So that's the prize, 1 copy of 10215 Obi-Wan's Jedi Starfighter. post if you have any questions or need clarification. Does the figure need to be enclosed or are open air speeders acceptable? Does the figure need to be seated within the ship or can the figure be in a recumbent position to fit within the ship? open air is fine, like a landspeeder. airspeeders, like the Incom T-47, are enclosed, so the chibi fighter remake should follow suit. the pilot/driver needs to be seated at the controls. Would using these be cheating? that is not a standard minifig. ThatGuyWithTheBricks wrote: So basically midi-sale stuff? It's a bit trickier than that. 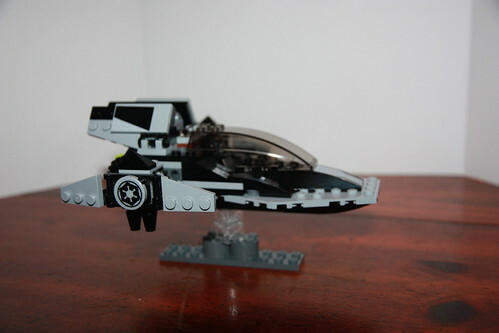 Essentially, the cockpit surrounding the minifig would be minifig-scale, but the rest of the vehicle would be of a somewhat smaller scale. ok so here is my entry. It's the jedi starfighter from AoTC.. Sorry about the posting too many pics... it's my first time and I'm posting from my phone in the airport. I think i have it fixed now though. Last edited by twshutika on Tue Jan 04, 2011 9:00 am, edited 1 time in total. you people kill me sometimes. and you submit up to two photos. TWO. So are we talking about JUST fghters or any Star Wars vheicle? If the latter is correct and I was planning on making an MTT does the model have to have a deployment rack like in the "real thing" or just look like it has one? OOM-9 wrote: So are we talking about JUST fghters or any Star Wars vheicle? If the latter is correct and I was planning on making an MTT does the model have to have a deployment rack like in the "real thing" or just look like it has one? 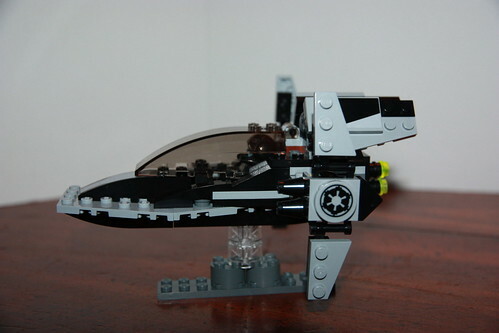 the first line of the rules wrote: Build a Star Wars-themed sea, land, air, or space vehicle as small as possible that can still seat a standard minifig. deployment rack is optional. it just needs to look like the original vehicle and seat a standard minifig. What's wrong with the MTT? I like the MTT! Anywho thanks for clearing that up. it wasn't your subject matter. it was your question. This is so cool! I missed out on the Bounty Hunter contest becuase I was lazy, but I'll definitely try this one. Some of these models are gonna be so cute hahahaha. I'm already almost done, and I must say it looks sweet! Here is my entry for the Chibi Fighter contest, my Chibi Imperial V-Wing. Edit: Uploaded new picts with a white background. Last edited by HoosierZephyr on Sun Jan 09, 2011 3:41 pm, edited 2 times in total. HoosierZephyr wrote: Here is my entry for the Chibi Fighter contest, my Chibi Imperial V-Wing. A small windscreen would look better, that extra large one just dominates the ship. If you look at Vader's TIE for 10188 you'll notice that the windscreen was scaled-down with the model. Also, maybe try a light background when the subject matter is so dark (in color). I will pull out my white background and take more pictures. Most Chibi Aircraft drawings I have seen had a normal or bulbous windscreen with everything else at a smaller scale. That is the look I was going for here. If a vehicle seats more than one pilot (ie arc-170) would the chibi version have to do that?